Ready to make an eye-catching statement for your next event? 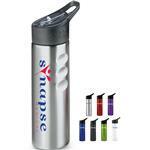 Then have your company name or logo imprinted on the Ranger 26 oz. water bottle! 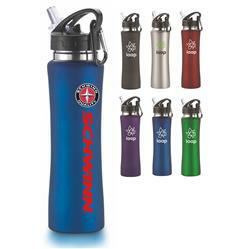 The stainless steel beverage holder features a push up spout and straw plus it’s BPA free; making it an ideal gift for charitable organizations and educational institutions. The smooth satin finish offers a perfect backdrop for building brand awareness! Great for fundraising too. Comes gift boxed. Available in blue, red, green, black, purple and stainless. Available Colors: Stainless Steel, Black, Blue, Green, Red, White and Purple.